Evliya Chelebi or Çelebi (1611-1684), pseudonym of Dervish Mehmed Zilli, was the son of a goldsmith at the court of the sultan in Istanbul. From 1640 to 1676 he travelled extensively through the Ottoman empire and neighbouring countries, both in a private capacity and at the service of the Sublime Porte. The account of his travels is recorded in his ten-volume Turkish-language 'Seyahatname' (travel book), which he completed in Cairo. The 'Seyahatname' contains a wealth of information on the cultural history, folklore and geography of the countries he visited. For seventeenth-century Albania it is of inestimable significance. Çelebi visited regions of Albanian settlement three times: Kosova in December of 1660, northern Albania and Montenegro in February of 1662, and finally southern Albania in November of 1670. His descriptions of the central Albanian towns of Berat and Elbasan during the latter journey can be regarded as no less than sensational, in particular for those who know the towns today. One can only marvel at the refined oriental culture he encountered in Albania, of which very few traces remain. From this place we descended westwards through vineyards and arrived in one hour at the imposing region of Jihad, the luxuriant walled town of Albanian Belgrade (Berat). According to the Latin historians, it was first founded by [...] and changed hands many times until, in the year [...], during the reign of Sultan Bayazid Khan, the supreme commander Gedik Ahmed Pasha conquered it from the Albanians, the Greeks and the Venetians. There are [...] fortresses called Belgrade in the Ottoman empire: firstly, Danubian Belgrade on the Danube river; secondly, Stolna Belgrade on the Buda frontier a little more than one stage from Budapest; thirdly, Transylvanian Belgrade which is under Ottoman jurisdiction; and fourthly, this Albanian Belgrade. According to the survey register of Suleyman Khan, it is the seat of the bey of the sanjak of Vlora in the eyalet of Rumelia. It is crown land for which the bey receives an income of 229,000 akçe from the sultan. It has 28 zeamets and 489 timars. It also has an alay bey and a ceribashi. In time of war, the sanjak bey is obliged by statute to supply the sultan with 4,000 armed soldiers, including his own armed retainers and those of the timariots. They are very rough and courageous soldiers. Berat has a grand mufti, a nakibüleshraf, a kadi with a salary level of 300 akçe and 120 villages, from the annual revenues of which the kadi has the legal right to six purses and the pasha to thirty purses. It also has the following dignitaries: steward of the spahees, commander of the janissaries, warden of the fortress and his [...] garrison troops, voyvode of the town, market inspector, collector of tolls, steward of the fortress, chief of the band of musicians, mayor, chief architect and poll-tax official. The sanjak of Vlora consists of nine kadi districts. The seat of the sanjak is Berat. North of this is the district of Myzeqe with thirty villages. To the east is the district of Tomorica. Near this to the south and east is the district of Skrapar. Bordering that to the south is the district of Përmet. South of Përmet is the district of Pogonia. West of Pogonia is the district of Gjirokastra which, however, belongs to the sanjak of Delvina. 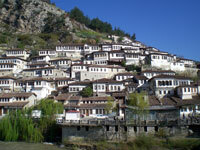 North of Gjirokastra is the district of Tepelena. South of that is the district is Vlora. These nine districts are very fertile, but some of the rayah are rebellious - may God preserve us from them. The fortress of Berat was conquered from Constantine the Greek and the Albanians. Shape of the fortress. Built like a candlestick on a steep and bare cliff stretching in a north-south direction, it is a mighty, solid and enduring fortress constructed of hewn and polished stone. Since it is in the interior of the country, it has not been kept up and its wall are now damaged in places. The total circumference of the fortress is 2,600 large paces. It has four strong and solid gates. First, facing north, is the Big Gate: from it down to the bazaar is a distance of 1,000 paces. This gate has three large doorways which are separated from one another by a distance of 100 paces each. Two of these doorways look towards the north, and the third one, the inner doorway, opens to the east. The foundation stones of the gate are as big as the body of an elephant. Such stones can otherwise only be found in Hebron near Jerusalem and in the fortress of Bender on the banks of the Dniester river. 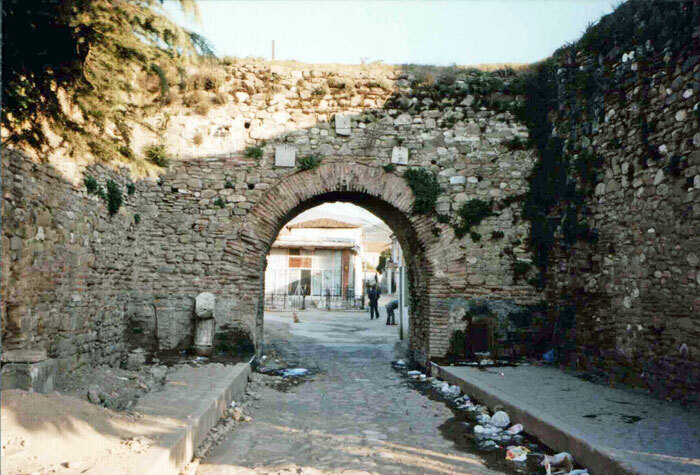 The second gate, below an ancient monastery, faces west and opens out onto the road which descends to the front of the new mosque built by Hüsein Pasha in the Murad Çelepia quarter. The third gate faces east between the quarters. It is a small, hidden gate and is not used very much. Shape of the citadel. It is a splendid small stone citadel, 800 paces in circumference, joined to one corner of the western wall of the great fortress. It has two gates. One opening to the east, faces the interior of the fortress, and the other, opening to the west, leads down outside the castle to the Çelepia quarter below, and so it inclines to the south.. All 7 (sic) of the above-mentioned gates are made of elm wood and not of iron, because they are all concealed behind towers. The doors of one or two of the gates are lying on the ground, since they are on the inside of the castle and the castle is in the interior of the country, and there is no great fear of attack. Within the citadel there are about forty to fifty houses with tiled roofs, one Mosque of Bayazid Khan (1), a few munitions stores, just six cannons, some outdated grain storehouses and cisterns (2), the house for the warden, and no other buildings. Outside the castle of Berat there is a total of 200 dilapidated houses with tiled roofs, most of them inhabited by Greek infidels. They have very big yards, but the gardens are not kept up. There is one isolated congregational mosque, that of Bayazid Khan (3), covered in tiles. It is a large old mosque with a stone-carved minaret, but with no congregation. There are eight churches, of which one is very large and well built. The streets are paved with unworked cobblestone. On the four sides of the fortress there are houses built against the walls. It has no moat on any side because it is surrounded by sheer gorges. On the south side is the quarter called Çekebeni ("Pull me up") Rock, a frightful cliff which soars into the sky and shelters the nests of falcons, eagle owls, eagles and kites. The gorge is so steep that no one dares to look down into it. There is a reason why the quarter of Çekebeni Rock bears this name. After the conquest of Berat, the accursed infidels once again besieged the fortress, and the Ottoman troops within were unable to alert the sultan. Finally, one of the brave warriors, willing to risk his life, was lowered down this cliff by a rope. He swam across the [...] river which flows in the gorge below, made his way straight to Edirne, and informed the sultan of the dire situation, i.e. that the fortress was being besieged by the enemy. Having been rewarded by the sultan with gifts, he set off once more and three days later arrived in the middle of the night at the foot of this cliff and shouted "Çeke beni!" ("Pull me up!"). They knew it was Ghazi Kuski - that is the name of the one who had gone to alert the sultan - and that he was shouting the agreed-upon password. They immediately drew up Ghazi Kuski with ropes and got him inside the fortress. "Welcome back! What news?" they inquired. "I bring greetings from the Padishah, his viziers and deputies and ulema and grand mufti. The sultan informs you that he will arrive in ten days with 50,000 soldiers to make war. Until then, he bids you give proof of your religious fervour and not surrender the fortress to the enemy. Here are the letters from the authorities." Those under siege were encouraged by the news and defended the fortress day and night with all their energy until help arrived, ten days later, like sudden death, in the form of 70,000 or 80,000 soldiers, who cut down the infidels with such a Bayazid-like sword that even today heaps of infidel bones can be seen on the plain of Myzeqe. After this victory, the sultan rewarded his soldiers for their efforts. He especially rewarded the courageous messenger who had cried out "Çeke beni!" granting him a large zeamet with a village of its own, which is still administered by the Çekebeni clan. From that time on, the cliff in question has been known as the Çekebeni Rock. It is a landmark, a shining white cliff like a vault of heaven, upon which are situated numerous towers, churches, belvederes and pavilions. The lower fortress. On the riverbank at the base of the cliff is another row of strong fortress walls. Along the banks of the [...] river, from the lower gate of the fortress at the end of the big bridge right to the gate of the Kettle Makers' Market, stretches a bazaar 800 paces long, an imperial market. Inside the fortress, there are 70 to 80 moderately well-built houses with tiled roofs. Aside from these, there is a main street with 80 large shops, and no other public thoroughfare, because there is the Çekebeni Rock on the one side and the [...] river flowing on the other. Master craftsmen carved a staircase into the mountainside from the lower fortress to the upper part. The base of this staircase is in the water and it ascends the fortress wall to the height of a minaret. It is 70 or 80 steps down, and from here leads into the large water tower - built in the water - near the gate of the Kettle Makers' Market. From the Çekebeni Rock down to the water tower there are also paths of hewn stone leading gradually downwards in 1,060 steps (4). Those under siege can use these paths to fetch water from the water tower without being seen by the enemy. The water channels below the Kettle Makers' Market are close to the ground but they too are invisible to the enemy. The owners of the shops in this lower fortress are all kettle makers except for a smattering of goat-hair spinners. Outside the gate of the Kettle Makers' Market, the late Uzkurli [...] constructed another bazaar which attracted a large settlement. This area is called Uzkurli (Skuraj) Town. From the Kettle Makers' Market eastwards to the goat-hair spinners stretches a two-story (5) main street 2,000 paces long. On the left and right are neat shops with tradesmen of all kinds. Most of the shops - 700 or so - are pious foundations which were donated by the Uzkurli family. There is no cloth bazaar as such, but one can find all manner of fine cloth fabrics, including brocades, gauzes and cloth-of-gold. Shawls are especially plentiful. The large open town of Albanian Belgrade (Berat). It is a huge open town, entirely outside the walls of the fortress. It is situated in a large area along the bank of the [...] river to the east and south of the upper fortress and is covered in vineyards, rose gardens and vegetable gardens. There are 5,000 one- and two-story stonework houses with red-tiled roofs. They are well built and attractive houses with gardens and are spread over seven verdant hills and valleys. Among them are over 100 splendid mansions with cisterns and fountains and an invigorating climate. Mansions of the nobles. One is the mansion of Hüsein Pasha. 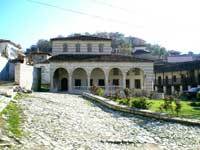 Another is the mansion reserved for the pashas: this is the residence of Osman Pasha, the brother of Çatalbash Pasha who is the governor of this vilayet. It was to Osman Pasha, in a public meeting, that I presented the imperial decrees and letters sent by the serdar Ali Pasha, and displayed the heads of the outlaws from Progonat which we had brought from Tepelena. "It is the Padishah's to command", cried Osman Pasha after the decrees were proclaimed. He immediately sent out heralds to sound the call for all the leaders of the sanjak of Vlora to muster their soldiers and set off in defence of Mania. For displaying the heads I was awarded a plumed crest and was dressed in a robe of honour, and for conveying the serdar's command, I was given one purse of kurush, one horse and one slave, and my servants were given ten gold coins and one length of material each. We then spent a week of rest and recreation at this mansion, where we had our quarters, and at several other fine houses. Among the other famous mansions are those of the Mehmed Efendi family, the Serdar Aga and the Uzkurli family. Names of the quarters. Berat has 30 quarters, including Murad Çelepia - south of the fortress, Uzkurli, Hünkâr, Vakëf (Pious Foundation) (6), Baba Kadi, Pashmakçilar (Slipper Makers), Ak Mescid (White Prayer House), Eski Bazar (Old Bazaar) and Gün Görmez (7). Then there are ten quarters belonging to the Christians and one to the Jews. There are no Armenian, Frankish or Gypsy quarters, but there are a lot of Latin (8) infidels who come and go for trading purposes. Mosques of the Ottoman sultans. 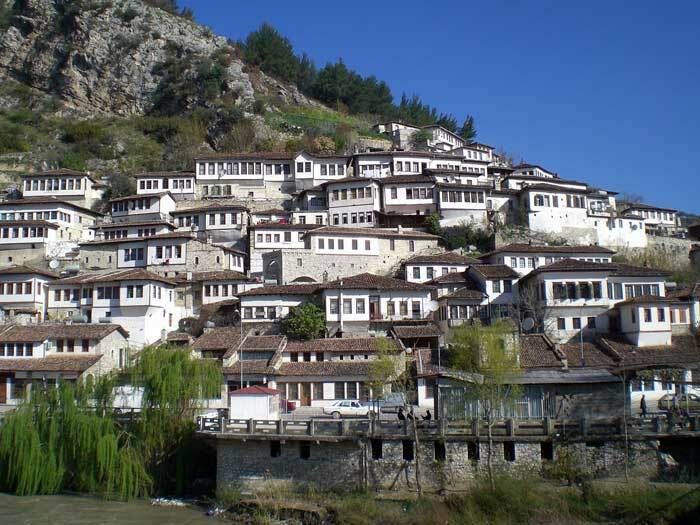 Berat has 30 prayer niches in all, of which the one with the largest congregation is the Mosque of Sultan Bayazid II the Saint (9) in the centre of town. This mosque is 60 feet long and 50 feet wide with a tall, graceful minaret. It has three doors - two at the sides and one in the qible wall. In front of the mosque is a porch which is as large as the mosque itself, though the courtyard is narrow. The mosque was constructed in the old style and has a completely tiled roof. In front of the prayer niche is the octagonal two-story Tekke of [...] Efendi. It is a Halveti tekke. 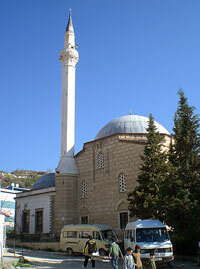 The Uzkurli Mosque (10): it has a high domed roof of carved stonework covered entirely in bluish lead. It is a radiant mosque with one tall and graceful minaret which can only be compared to the minaret of the Mosque of Melik Ghazi in the town of Niksar in the eyalet of Sivas. The porticoes around the outer courtyard of this mosque have a lead roof of seven lofty domes supported by tall columns of white, polished pillars. The medrese, the primary school, the tekke and the soup kitchens (11) have lead roofs, too. In the upper fortress is the Hünkâr Mosque, also known as the Fethiye Mosque (Mosque of the Conquest). Living, Glorious, Seeing, Powerful, Steadfast. Year 1081 A.H. [1670 A.D.]. The mosque has an elegant, tall, hexagonal stonework minaret. Its domed roof is round like a blue bowl and is covered in red tiles, giving this beautiful mosque a particularly pleasing and spacious atmosphere and making it a peerless and elegant architectural monument. The Mushka Mosque (13), near the courthouse: like a garden of paradise. These are the most famous congregational mosques. Neighbourhood mosques. There are a total of [...] including those in the quarters of Vakëf, Murad Çelepia, Baba Kadi, Pashmakçilar (Slipper Makers), Ak Mescid (White Mosque), Eski Bazar (Old Bazaar) and Gün Görmez, plus eight others, but the ones listed are the most prominent. Medreses. Berat has five schools training ulema, the best known of which are the Medrese of Sultan Bayazid II the Saint, the Uzkurli Medrese, [...]. There are no other institutions for instruction in hadiths and Koranic studies, but each mosque has its own learned professors who teach all the religious sciences, since there is a great demand. Primary schools. There are [...] including those of Bayazid Khan, Uzkurli, Sheikh Aziz, Murad Çelepia and the Tekke. These are the most famous. Baths. There are two bathhouses with hot water, one being the Uzkurli Bath in front of the Uzkurli Mosque. This is an extremely pleasant and refined building with a good atmosphere. The other is a grandiose building situated at the Tanners= Market, a clean, bright and airy bath with good service. Private baths. There are 170 private baths, thus one in all the great mansions - or so I have been told by the town rakes. Made a charitable deed to rouse envy in the beholder. In 1054 ----- (?) this stone fountain. Year 1054 A.H. [1644 A.D.]. This chronogram is inscribed in white letters of celi script on a dark blue tile over the fountain. There is another fountain, at the head of the Saddlers' Bazaar, also by Kasim Aga and also containing this same chronogram on a tile. Aside from these, there are nine fountains donated by the Uzkurli family. Markets and covered bazaar. There are [...] splendid markets with pleasant and well-ordered shops, including those of the saddlers, the cobblers, the tanners and the kettle makers. Along the river is the beautiful bazaar recently constructed by Hüsein Pasha with 100 shops, all on the same plan. It is a gathering place of the cognoscenti. Here, in porticoes under the shade of various trees, one finds all sorts of skilled tradesmen and handicraftsmen busy at work in their various professions. In the middle of the bazaar there is a large square with - a marvel - a lofty clock tower. The clock was brought from Transylvania and the bell could hold ten people. It rings out twelve times at noon. The sound of the bell can be heard at the distance of one day's march. The clock tower is so wonderful that it cannot be described. It must be seen to be believed. In the vicinity of this bazaar there are six coffee houses, each one painted and decorated like a Chinese idol temple. A few of them are on the bank of the [...] river which flows through the city. Here some people bathe in the water, some come to fish and others gather to converse with their friends on matters both religious and secular. There are many poets, scholars and writers here possessing vast knowledge. They are polite and elegant, intelligent and mature, and given more to carousing than to piety. The Tanners' Market along the riverbank is situated in the shade of lofty plane trees, willows and vines, making it an attractive place for people to come and spend their leisure time, even though it is the workshop of Ahi Evran (16). The Kettle Makers' Market, with its rhythmic and steady "takatartak takatak" produced by the anvils and hammers of the coppersmiths, is also a shady and cheerful-looking bazaar with shops on a single plan. The Silk Makers' Market, which is also very clean and tidy, offers a view of exceptional beauty with all the handsome young men there. They are so good-looking that the marrow of the bones of their fingers is visible. Through the entire bazaar flow streams of water which ensure such cleanliness that a man could sit down on the road and let himself be enraptured by the surrounding beauty. The lads in the shops are like royal princes, never struck by the light of the sun. Most of the shops on the two sides of the streets have wooden roofs. Here it is that friends, companions and lovers spend all their time chatting up the boys as they work, and there is no shame in it either. Indeed, the master craftsmen and even the fathers and mothers of the boys take great pride in the fact that their apprentices and sons are being courted. Khans of the great merchants. There are five fortress-like khans with tiled roofs. Inns of the unmarried craftsmen. There are six inns offering rooms to unmarried tradesmen without houses of their own. Soup kitchens. There are also three soup kitchens, those of Bayazid Khan, of Uzkurli and of Aziz Efendi. Rivers. Through the city flows the Osum river which takes its source to the south in the mountains of Skrapar, Osum and Tomor and which, after passing through Berat, flows westwards onto the plain of Morava and, after passing the estate of the son of Kara Osman Bey, joins the [...] river (17) in Elbasan. The two having joined into one huge river, it passes over the Plain of Myzeqe and flows into the Gulf of Venice (18) near the fortress of Bashtova. The Osum river in Myzeqe is navigable in summer and winter. Koru Varosh (Gorica). Across the Osum river on the south bank stretches another beautiful town, called Gorica, of 200 houses with tiled roofs, surrounded by gardens, orchards and vineyards. It is inhabited mostly by Greek and Albanian infidels. Behind this town is the Mount Koru (Mount Gorica), from which the town derives its name. It is a massive and lofty mountain covered in large, tall trees. The timber from these trees is used for the upkeep and repair of the bridge over the Osum river. Anyone who cuts even a single branch is punished by the authorities. At the same time, anyone who commits a murder and manages to take flight and hide up in the mountain is safe from prosecution, but he may never return to the town. If the murderer returns, he will be executed, so if he does escape, he is in permanent exile. Pleasure grounds. 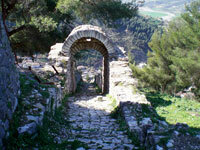 There are 77 parks and pleasure grounds in the vicinity of Berat. The foremost of these are: the Çekebeni Rock pavilions in the upper fortress, Tanners' Bazaar porticoes in the town below, the square at the new bazaar with its trees, the foothills of Mount Tomor where the young men go hunting, and this park on Mount Gorica. The latter, with its meadows and tulip glades, is a Persian paradise, recalling the gardens of Meram near Konya and of Aspozo near Malatya. Some of the spots are refreshed by flowing water. The benches in the shade of the lofty trees are large enough to sit groups of 100 men each. In some secluded spots on the mountain, the town rakes, like so many libertines, may spend an entire week eating, drinking and carousing. In short, it is an excellent place for having a good time. Gorica has no khans, baths or bazaars, but it does have two churches. 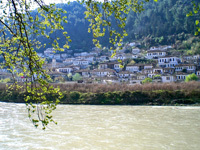 It can be considered one of the quarters of Berat - the one across the river. The houses along the water are all outfitted with fishing weirs. At times, when the waters of the Osum river overflow, the houses of Gorica, and also those along the riverbank on the other side in Berat proper, get flooded, as do the Tanner's Market park, many of the private garden pavilions, the coffee houses and the tailor shops. All the great mansions of the town have their windows facing the river. Usually these houses get flooded, too, but they are little damaged because they are strong and well built. Noteworthy bridges. Just below Berat at the end of the Kettle Makers' Market there is a bridge across the Osum river to Gorica. It is a large wooden bridge with nine arches. The supports of the bridge are in the water and are constructed of stone. The surface of the bridge is paved with thick planks of oak cut from trees on Mount Gorica. It is quite a marvellous bridge (19). The only one similar to it is the single-arched bridge which Sultan Suleyman built over the Drina river at the town of Foca in the vilayet of Hercegovina. 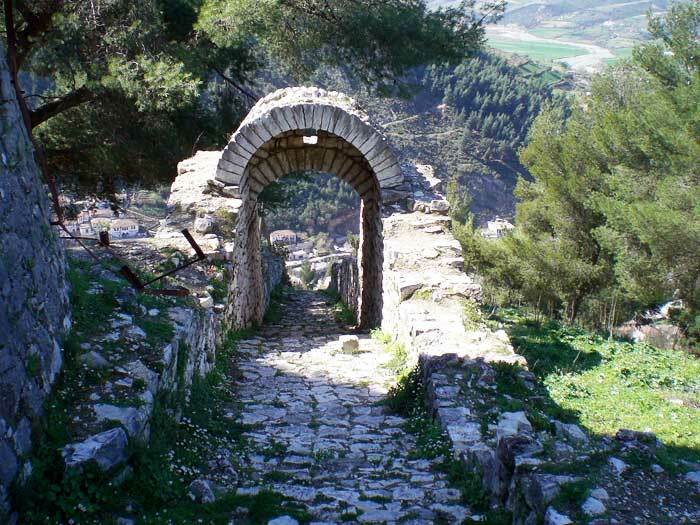 But this bridge of Berat has nine arches - may God preserve it. The Osum river, which passes under this majestic bridge, flows through the plain which is opposite Berat and irrigates the thousands of rice fields and vegetable gardens. 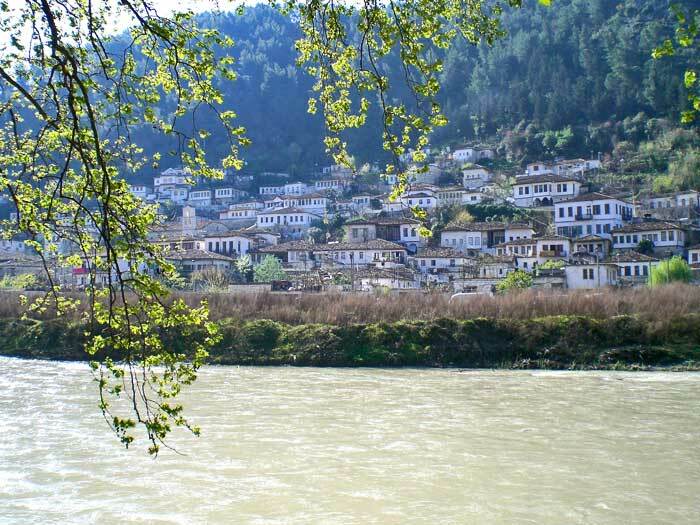 Many of the inhabitants of Berat drink the water from the river, which is extremely clean and good-tasting. The rice is delicious and is exported throughout Albania. Mount Tomor. Two hours to the south of Berat is Mount Tomor, a very high mountain which can be seen five to six days' march away. There are all sorts of useful plants and herbs and grasses on this mountain. Every year, physicians come here from Western Europe and Latinistan (20) and climb up the high mountain to collect great quantities of medicinal herbs. The streams which originate in this mountain and flow down its sides sustain 11 surrounding kadi districts. The ones south of the mountain eventually flow into Lake Ohrid. There are also many kinds of creatures and insects on this mountain which are found otherwise only on the mountains of Bisutun, Süphan, Demavend, Sehend, Ararat, Bingöl and Elburz. In short, this high mountain makes an excellent place for outings and for hunting. Through the plain to the north of Berat it is a 5-hour journey to Elbasan. With its many alpine pastures, Berat has a very healthy climate, and as a result, there are many lovely lads and lasses, adoring to their lovers, yet very well bred. All the young men go about armed because - God help us - this is Albania and no nonsense about it. They swear only by their shpatë, i.e. their sword. Those who are not soldiers or sailors but peasants generally leave town and go to Istanbul where they serve as professional attendants in the bathhouses (21). Favourite foods and drinks. Among the best-known dishes are: Albanian white buns (simid), chickpea rolls, chicken börek, types of cheese called jamuk and qumështuar, fried börek and eggs, baklava and fresh cream, and almond samsa. Of the best-known drinks is a red grape must called reyhania produced by boiling grapes of various kinds. A glass is enough to make you drunk and will keep your brained perfumed with sweet basil (reyhan) and ambergris for an entire week. In short, this town is famous for its reyhania. In addition to this, they make a boza of millet like a white sieve which is thirst-quenching, very much like the Egyptian rice beverage known as subya. Among the fruits are lüffan pomegranates as big as a man's head, as well as olives and figs, the entire region being decked out with orchards and gardens in great numbers, though lemons and oranges do not grow here. Professions. All types of crafts are to be found here, but most of all they work as tradesmen, based on the Arabic saying "The tradesman is the beloved of God." They travel from vilayet to vilayet selling their wares and produce. One group are the commoners or town roughs; another are the ulema; a third are the craftsmen who mainly ply their trades in the town: saddle makers, jewellers, cobblers, silk makers, kettle makers and tanners. Clime. According to the science of astrology and astrolabe, this city is in the middle of the fourth clime. The latitude is [...]; the longest day is [...]. Auspicious star. According to the astrologers and the master diviners Padre and Colon, the rising star of Berat is in the constellation of Virgo, the mansion of Mercury, earthy. As the town has abundant produce, the people are all very down to earth. They are of a sedate and compliant disposition. There are a good number of notables, viziers, deputies and learned and devout individuals who come from this town. Completion of the eulogy of Berat. The people are very zealous and courageous ghazis and they are governed by prudent and foresightful agents and administrators. They are neat and clean. This is the Qurayshi clan of gentlemen among the Albanians. They claim to be Sunnis and strict followers of the Hanefi school. But among them are many men who are lax and easygoing and who cultivate the mystical sciences. Shrines. The mausolea which ought to be visited are those of Vaiz Mehmed Efendi; Jim-Jim Hodja; Emirler Sultan, in the courtyard of the Mosque of Sultan Bayazid II the Saint; Pir Mehmed Efendi, just to the south of the Uzkurli Mosque; and Sheikh Ali Dede, in the cemetery of the public square near the bridge [...]. May God's mercy be upon them. When Sultan Mehmed the Conqueror was on his way from Skopje to conquer Shkodra, he turned his reins against Elbasan and sent in advance a force of 40,000 men under the command of Koca Mahmud Pasha. With Basanya, now under the Muslim name Mehmed Bey, showing them the way, and having subdued the surrounding countryside (él bas-), they entered the town one night. Mehmed Bey found his brother Banya asleep and slew him, thus conquering his father's city with the assistance of Mahmut Pasha and the Ottomans. All the Greek and European infidels within the town were put to the sword. Once the town, the surrounding countryside (él), and the population of the vilayet were brought under the sway (bas-) of Basanya, also known as Mehmed Bey, the town was renamed Elbasan ("He who subdues the province") (23). The Latin chronicles have many long tales to offer about the town, but we have recorded its history in summary fashion. Basanya Mehmed Bey went by forced march to bring the sultan the good news of his conquest of the town. The latter was delighted to hear the wonderful news and, congratulating him, offered Mehmed Bey rule over the town which had belonged to his father. The sultan also authorized him to mint silver coins in his name, exploiting the silver mine, and to pacify the surrounding region. 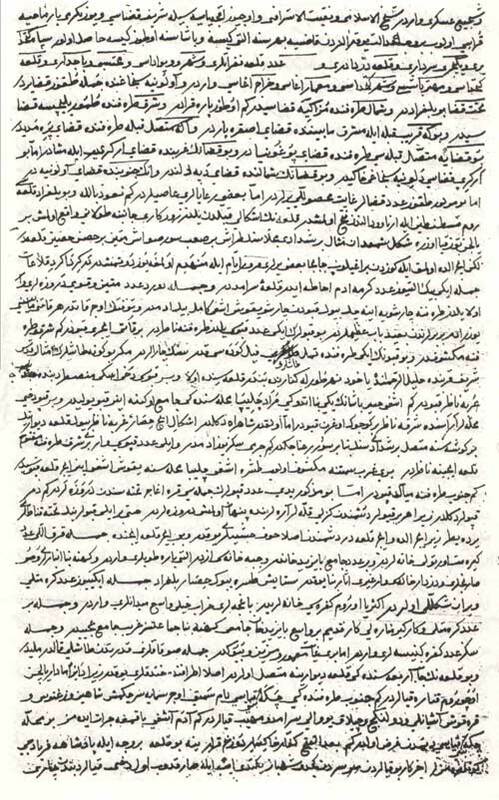 Then, the blessed Ak Shemseddin, Emir Buhar and Molla Gürani prayed for the easy conquest of this land, reciting the Fatiha (24) for the intention expressed by the sultan. And shortly thereafter, during the reigns of Mehmed the Conqueror and Sultan Bayazid II the Saint, the conquest of all of Albania and Hercegovina actually took place. Subsequently, in accordance with the survey register of Suleyman Khan, Elbasan was made the residence of a bey for a separate sanjak in the vilayet of Rumelia. For this crown land, the bey was allotted an income of 201,963 akçe by the sultan. Elbasan has 18 zeamets and 138 timars with an alay bey and a cheribashi. In time of war, the timariots are required by statute to muster a force of 4,600 select and armed soldiers. Whenever the vizier of Rumelia goes on campaign, the sanjak bey of Elbasan goes with him. The chief magistrate, i.e. the kadi, has a salary level of 300 akçe and supervision over [...] villages. The annual income of the kadi is ten purses and that of the bey is thirty purses. Of the other high ranking officials are: the grand mufti, the nakibüleshraf, the notables, the substitute kadi of the town, the market inspector, the collector of tolls, the poll-tax official, the steward of the spahees, the commander of the janissaries, the warden of the fortress, and a total of [...] garrison troops, five agas of the fortress, the chief architect, the mayor, and the infidel servants of the fortress who are exempt from taxes. The infidel rayah are governed by twenty elders (portoyoroz). Elbasan has a strong and well-disciplined administration. Both the rayah and the free Muslim citizens are respectful and obedient to the authorities. The sanjak of Elbasan has ... kadi districts, including Bashtova and Myzeqe in the south, Durrës in the west, and [...]. In all, the sanjak has 526 villages under its jurisdiction. Many of them are exempt from taxes and many are state property, and the beys cannot intervene in their affairs. The fortress of Elbasan is situated on a level fertile plain which stretches northwards and southwards for a quarter of an hour. The surrounding hills and mountains are covered in vineyards. This square and solidly built, ancient construction is situated in a broad valley on the banks of the Shkumbin river. It is 15 ells high. The outer ramparts of the fortress are skilfully constructed and have 50 towers (25). It is surrounded on all sides by a moat the depth of which is equal to the height of two men. It is 50 ells wide and filled with gardens and vineyards. The circumference of the fortress is 2,400 paces. It has three iron gates, one to the east, one to the west, and one to the south in the direction of Mecca, across from the coffee houses in the bazaar. This large gate is much used and has double doorways, as do the others. The fortress itself has double walls and this is why the gates have double doorways. On the vault (26) over the southern or bazaar gate there is a block of white marble on which are inscribed in celi script the names of the forefathers of Mehmed the Conqueror back to Osmancik (27) and the date [of the conquest] of Elbasan: 859 A.H [1455 A.D.] (28). Also above this gate there are three quadrangular blocks of white marble, suspended in chains, showing traces of arrow and bullet shots. All who go in and out of the gate remark on them (29). Over the gate at the second-story level is the Hünkâr Mosque (30), an old stonework building with a tiled roof. Near the mosque there is a high clock tower (31). The clock was very skilfully constructed and is quite accurate, never losing a minute or a second, so the muezzins of all the mosques follow it faithfully. Inside the fortress there are 460 old, rather spacious one- and two story houses with tiled roofs but without vineyards and gardens. This is where the home of the warden is. But since Elbasan is in the interior of the country, there are no garrison troops or houses for them. Instead, there is a contingent of infidels serving the fortress, who are thus exempt from taxes. Your door is open to all the needy. And the honour of its owner depends on his generosity. As one can see from these and thousands of other verses like them, home owners in this town consider it shameful to close their doors and to be without guests or to eat alone in the presence of their servants only. For this reason, there are no homes without guests and wayfarers. They do not grow weary of them even when the latter arrive with servants and horses and stay for an entire month. Should guests happen to be here at the end of the year, they are given a holiday garment suitable to their circumstance. In the forty years I have been travelling, I have never encountered this kind of good will except in the person of Hizir Aga, commander of the janissaries in Syrian Tripoli, and here in Elbasan. Quarters. The open town, which is like the fabled garden of Irem, has 18 Muslim quarters and 10 infidel Greek and Albanian and Latin quarters. There are no quarters for Jews and Franks and Armenians, or for Serbs and Bulgarians and Voyniks. The latter groups only come here to do business, lodging in the khans and then departing. If they come with the idea of taking up residence, they are slain immediately. This is an ancient custom. The famous quarters are [...] and [...]. The mosques of the Ottoman sultans and benefactors. 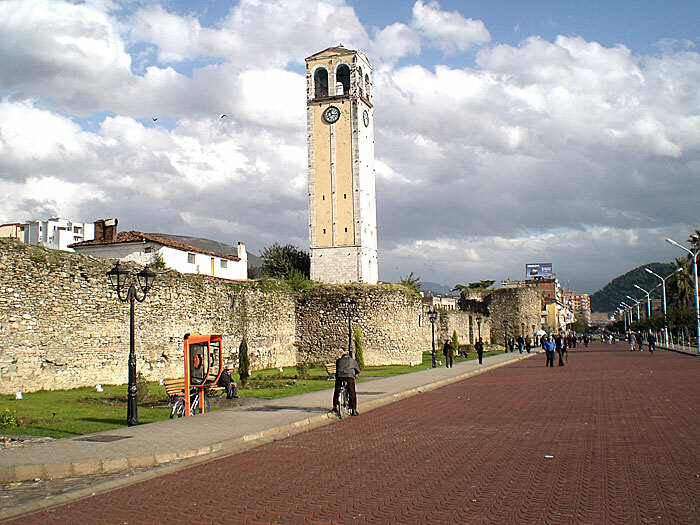 Elbasan has 46 prayer niches (32), of which the oldest is the Mosque of Mehmed the Conqueror (33) built over the gate of the fortress at the second-story level, a building with a large congregation. In the middle of the fortress is the large old Mosque of Sinan Pasha (34), a one-story construction. The outer sides of its four walls are completely covered (35) in couplets, poems, qasides, hadiths and single verses inscribed by travellers from Turkey, Arabia and Persia. Each of them wrote one in his own hand, in fine calligraphy. If one were to collect all the inscriptions, they would make up 100 volumes. This mosque has been visited by thousands of poets who have vied in displaying their skill, and so the exceptionally smooth, polished and shiny walls are covered in countless works of art. Indeed, in accordance with my old practice of leaving my mark in whatever village or town or place of worship that I visit, I too had the impertinence to write a couplet, and signed it: "Written by the world traveller Evliya, year 1081 A.H [1670 A.D.]." The chroniclers have given special names to each city, and this Elbasan is known as the "Abode of Poets". The Sinan Pasha Mosque inside the fortress with its large congregation has a spiritual atmosphere, but it is now full of biscuits stocked for the Ottoman army preparing to attack the fortress of Kotor in Venetian territory. In fact, 1,000 quintals of these biscuits were loaded onto carts and sent to Durrës and from there to Mania by ship for the Ottoman troops there. This house of God resembling paradise. Praise to God that he completed this charitable work. May God accept it for the sake of the essence of Unity. Day and night, people will pray, "Mercy on his spirit." of prayer of the community. Year 1017 A.H. [1608 A.D.]. At the grain market is the beautiful new Mosque of ... of Biçakçi-zade (38) with a marvellously well-proportioned minaret. The Mosque of the Hare: fair and radiant (39). The Mosque of Sinan Bey near the courthouse. It has a large congregation. These are the best known congregational mosques. Neighbourhood mosques. There are 20 smaller prayer houses, including [...]. Institutes for Koran interpretation and the training of ulema. There are [...] medreses, including [...]. Institutes for the study of hadiths. [...]. Institutes for the training of Koran reciters and memorizers. [...]. Dervish tekkes. There are 11, including the Halveti tekke of Sinan Pasha inside the fortress, with numerous dervishes and endowments, unmatched anywhere else; the famous tekke of the Hünkâr Mosque, with its masters of poverty and mystics engaged in withdrawal and isolation; the tekke of Hadji Hasan, where men of God retire into a corner and engage in quiet meditation; and [...]. Soup kitchens. There are three public guest-houses which every morning and evening feed rich and poor, young and old, Christian and Zoroastrian. They are: the Hünkâr soup kitchen, the Sinan Pasha soup kitchen and the Tekke soup kitchen. Khans of the merchants. There are 11 khans, including [...], [...]. Bazaars. The grand bazaar of Elbasan has 900 shops, although they are not all on one main street. Rather, the shops are laid out along all the public thoroughfares. These attractive bazaars are well stocked, clean, orderly and well kept, roofed and shaded. The nicest markets are those of the saddlers, the silk makers and the goldsmiths. There are seven coffee houses, like all painted Chinese idol temples, gathering places of scholars and poets. If I were to describe each one of them it would be very tedious. The city has no stonework-covered bazaar adequate to its prosperity, but precious goods from all over the world can be found, including garnets, rubies, diamonds, emeralds, embroidered silks, gauzes, brocades, velvets and other fine fabrics. Professions. All the craftsmen and tradesmen are to be encountered here. In particular, there are many silk makers, Albanian shield makers, arrow makers and bow makers. The place is famous for the manufacture of fine weapons. Physicians. There are 47 doctors and pulse takers, the most outstanding of whom is the Latin doctor Frangulis; and the physician Muhyi Çelebi is like the breath of the Messiah (40). Oculists. There are three eye doctors, notably [...]. Surgeons and phlebotomists. There are quite a number of surgeons, but especially [...] is a great doctor; [...]. Market day. A large public market is held in Elbasan every Sunday. On this occasion, thousands of people, large and small, men and women, come in from the villages and surrounding areas, towns and fortresses. You can hardly make your way through the streets. All the lovely boys and girls gather here, too, displaying their hidden wares, ogling and haggling without stint and without scruple. On such days, fair Albanian maidens also come in from the villages, each one with the face of a nymph and the form of an angel. Every Sunday, in short, Elbasan is crowded with people and decked out with merchandise, making this market town the bride of Albania and of Rumelia. All the roadways of the bazaar are paved with cobblestones, and along the gutters on either side flow sparkling streams which cleanse all the roadways. The streets in the textile market in particular, and in the markets of the arrow makers, bow makers, knife makers and sword makers, are lined with mulberry trees, lofty plane trees and weeping willows and thousands of vine trellises, so that all the merchants can sell their wares while sitting in the shade. The other markets are planted with various types of trees, too, providing shade for all the shop owners. The sun cannot penetrate into this beautiful bazaar at all. Being like the fabled garden of Irem, this town can be compared to Košice (41) in the vilayet of Kurs in Hungary. Baths. Elbasan has three heart-relieving bathhouses. 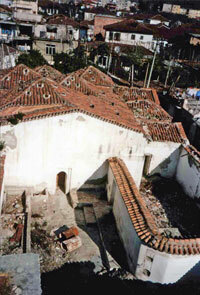 First of all is the Bathhouse of Sinan Pasha (42) within the fortress near the eastern gate in an old building. Its water and atmosphere and construction are quite pleasant. It gets its water from outside by means of an aquaduct crossing the moat. In the open town is the Bazaar Bathhouse (43), a spacious, agreeable and clean building with lovely serving boys and furnishings. [...]. Private baths. According to the mayor, the town has 160 baths in the mansions of the well-to-do. He is the revered Chief Architect, a pure face. Pure water has come for the sake of Muhammad Mustafa. Year [...]. On another of the fountains the chronogram "pure and clear" is to be found. There are also the fountains of Biçakçi-zade, Cemali and Vaiz. Khans of the bachelors. Elbasan has nine khans which offer rooms to unmarried transients. They are used by skilled tradesmen away from home. Complexion of young and old. Because the climate of the town is agreeable, even people over 100 years old still have ruddy faces, not to speak of the youths. Lovely boys and girls. They are famous here for their beauty and grace, and they have beauty marks like that of the Hashemite (46). Names of the notables. The foremost families of Elbasan are firstly that of our patron Cemali-zade, Hisim Mehmed Pasha-zade, Biçakçi-zade, Çavush-zade, and that of the warden. These are the most famous. Men's dress. They all wear long broadcloth robes and turbans. The young men wear red felt caps, vests, buttoned trousers and kubadi slippers. Language and technical terms. All the people speak Albanian. Most also know good Turkish, and the ulema can read Persian. Greek and Frankish are used by the merchants. Men's names. Most of the names are like Cemali-zade, Kasim-zade, etc., but the town roughs have names like Çelo, Meto, Pasho, Afo, Hamzo and Koçi. Women's dress. Most of the women and girls wear broadcloth robes and go about in flat headpieces which they cover with white muslin kerchiefs. Women's names. Common names are Selime, Salime, etc. Slavegirls' names. Among the names for female slaves are Canisi, Hanifi, etc. Fine buildings. First, the fortress of Elbasan is very well constructed. Equally sturdy constructions are the mosques, underground water channels, lofty minarets and khans. Climate. The town has an excellent climate, always temperate in winter and summer. Wells. According to what the mayor told me, there are 2,060 operative wells with good-tasting water. Clime. According to the science of the astrolabe, the city is in the fourth clime. Its latitude is [...] and longest day is [...]. Rising star according to the astrologists. This city's rising star, according to the ancient sorcerers, is in the constellation of Libra, mansion of Venus, airy, so the people are cheerful. Dispraise of the churches. There are a total of [...] churches, including [...]. Cereals and vegetables. All kinds of crops are grown here, of which wheat, millet, barley, lentils and [...] are very abundant. Foods. White çörek cakes, spiced and sweet breadrolls, chickpea buns and 40 other kinds of food are highly praised. Fruits. The pears weighing 1 okka apiece are very famous, as are the apples, juicy cherries, quinces, cornelian cherries and chestnuts. Beverages. The drinks which are consumed here include red wine, grape juice flavoured with mustard, reyhania, sour-cherry juice, honey mead and boza. Bridges for people and animals. The main bridge is the well-constructed wooden bridge over the Shkumbin river which flows through the town; its upkeep is supported by large endowments (47). Vineyards and gardens. According to the toll collector, there are 21,000 gardens; some pay tax per dönüm but most are exempt. Prayer grounds. There is a delightful public prayer grounds situated in a meadow shimmering like green duhavi velvet and adorned with 50 tall cypress trees (48). Pleasure outings for gentlemen. 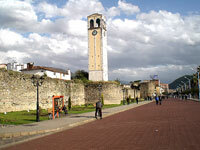 Elbasan has numerous spots for leisure and relaxation, both in town and out. Indeed there are 70 private and public parks with grass and flowers, suitable for picnics and outings. One such site is the so-called Loggia Pavilion (Loshka Köshki), outside the town, where every afternoon lovers gather behind the tall trees and in the shady spots and flirt with their beloveds. It is a delightful gathering place for men of culture. 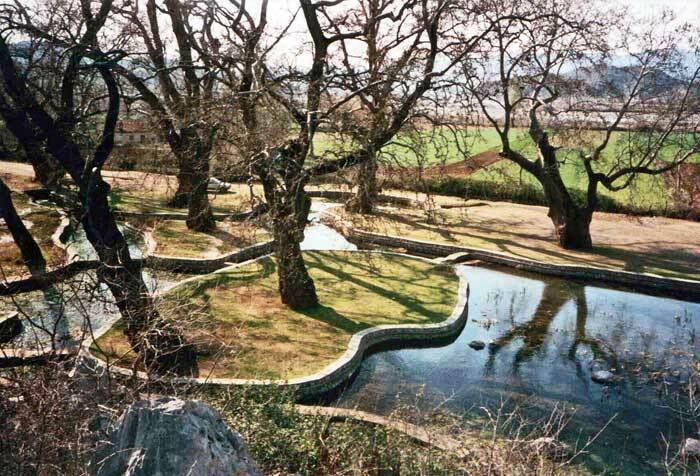 Another is Aynü'l Hayat (Spring-of-Life) Park, a grassy meadow with pavilions amidst ponds and fountains of sweet water, like wine from paradise. It is located among the vineyards and slopes to the north of the town. Büzürg Seng (Big Rock) Park, outside the town on the south side across the Shkumbin river, is a resort for lovers in a large open meadow full of palm trees and rose gardens. The Albanians call this spot Boz Eshek (Grey Donkey), a corruption of Büzürg Seng; and indeed, there is a big rock in the middle of the green meadow, which is why it is known as Büzürg Seng (49). It is a beautiful natural setting, without its like in Turkey, Arabia and Persia. Rising into the heavens are hundreds of plane trees, poplars, oaks, cypresses and willows, planted in rows. On all sides are orchards and gardens of roses and other flowers. Water flows continually through the various pavilions and pleasure domes with their pools and fountains fitted with water jets. These buildings are equipped with many kitchens and well-stocked pantries and the park is ornamented with numerous wrought iron trellises and bowers. The water from the jets is projected up into the branches of the plane trees, like the Water of Life. Here, countless love-stricken young men come to sing love songs to the handsome boys they adore, whose red lips are like roses and cherries. They pour out their emotions so sweetly and sadly that the nightingales get tongue-tied with admiration. In every corner there is flirtation and fun and drinking and carousing, with music and singing and other entertainments day and night, like New Year's eve. There is a crystal clear stream of water continuously bubbling out from beneath Büzürg Seng or Big Rock, in the middle of the park. Even in July none of the lovers dares to reach into the water and bring out three stones - only if his beloved were to command him to jump into the water, of course he would do it - so cold is the water from this spring, betokening the wine of paradise. Once a year, a huge country market is held in this park, and thousands of notables from town and from the surrounding villages come and pitch their tents. It is a huge fair with a sea of people like the fairs in Dojran (50), Mashkolur (51), Elassonos and Mistra. Trading flourishes at this time; in ten days and nights money is spent equivalent to five Egyptian treasures. The people of Elbasan get some pleasure out of life and spend their days and nights feasting and merrymaking, like the feast of Kurban Bayram (52). The park of [...]; [...]. There are other parks and spots for leisure, too, but these are the most famous ones. Is it possible to change the judgment of God? Alas! the kingdom of knowledge has been plundered. Justice! fate is always so cruel. Yahya Beg-zade was pious in worship. Ah, the plague has ruined the city. Year [...]. This chronogram is inscribed on the wall of the Mosque of Sinan Pasha. We saw thousands of such chronograms on all the khans, mosques, prayer houses and medreses. To record them all is beyond our capacity, and furthermore would hinder our travels and would be considered loquaciousness, so we will stop here. The mausoleums of the saints are in the fortress at the Tekke of Sinan Pasha and are visited by many pilgrims. One is the shrine of Sheikh Ilham Sultan. Another is that of the pole of the horizons, the absolute beloved and lover of the Living and Beloved One, Sheikh Dede Maksud, of whom they say the body, wrapped in his patched cloak and a prayer rug and with prayer beads in his hand since the time of Mehmed the Conqueror, is still fresh. May God have mercy on them all. The mausoleum of Jabal-i Alhama, ancestor of the Albanian people. He is buried in the [...] park in a place called [...] outside the city of Elbasan. All the Albanians visit the grave, claiming him as their ancestor. Over a long period they have placed large stones on his grave. An account of his life was given in an earlier chapter. Now, because he is buried here, we would like to write in more detail about his adventures. Jabal-i Alhama himself was of the Quraysh tribe and a companion of the Holy Prophet. He took part in the Muslim expeditions of Tabuk, Uhud, Tabut (? ), Khaybar, and Badr-i Hunayn. He also fought in other battles and was a courageous Arab chieftain and ghazi who offered the Holy Prophet the heads and tongues of many prisoners. Later, during the caliphate of the blessed Omar, he put out the eye of an Arab sheikh, either wilfully or by accident. The Arab sheikh, holding his gouged eye in his hand, went to Omar and said: "Oh Omar, it is my right under the law of the Holy Prophet to demand the eye of Jabal-i Alhama for my own." They summoned Jabal who, when asked about the matter, replied, "Oh Omar, it is the eye of an Arab of my own tribe. I put it out." His confession was recorded in the Shari'a register, and it was ordered that Jabal's eye be put out in accordance with the definitive Koranic verse in surah [...] (5:45) "And We prescribed for them a life for a life and an eye for an eye." Unwilling to comply, on the grounds that "There should be no shame" ('ar-na-bud), Jabal-i Alhama fled with his entire clan to the emperor of Byzantium, Heraclius. He settled in the Jabaliyya mountains and that is why these mountains bear his name. When the blessed Omar conquered Jerusalem, Jabal could not remain any longer in that place, so they boarded ships and took refuge with the king of Spain. Jabal-i Alhama was given the mountains of Dukat, Progonat and Frengis in the Albanian regions of Vlora and Delvina to live in, which were under Spanish rule. These lands were previously uninhabited and, within a short period of time, he settled them and, mingling with the Franks, they created the Albanian language from a mixture of Frankish and Arabic. The place they originally inhabited, and where they still reside after many generations, is now called the mountain of Kurvelesh (Quryelesh), since they are descended from the Quraysh tribe of the Arabs. Accordingly, the Albanian people boast that they are from the Quraysh, the companions of the Prophet. Although Jabal-i Alhama died as a Muslim and was buried at this site according to his last will and testament, some of his descendants intermarried with the treacherous Franks and became Frankish and bookless themselves. The Albanians of Kelmendi, Montenegro and the mountains of Kurvelesh and Progonat and [...] became infidels and people without the book. They do battle day and night with the Muslim Albanians, who are their own kinsmen, and take one another prisoner. Many Albanians had abandoned their faith before the arrival of Mehmed the Conqueror. Later, when the Ottomans conquered Shkodra, Ulcinj, Bar, Lezha, Durrës, Berat, this fortress of Elbasan, Vlora and Delvina, all of Albania once again converted to Islam. Only the infidels of Kelmendi, Montenegro, Kurvelesh and some other mountain ranges continue to resist, saying, "God forbid that Jabal-i Alhama should have converted to Islam." In the Tuhfa history, however, it is written that he did become a Muslim. Even when he fled in shame because of the gouged eye and when he was staying with the Emperor Heraclius, he refused to join his own emperor in battle when the Prophet's companions attacked the infidels and cut off their heads, but secretly aided the Muslims. Later, when he joined Constantine, he refused to assist the Christians in the battle of Antioch against the Arabs. For this reason, the Albanians claim that Jabal-i Alhama was a companion of the Prophet and that he died a Muslim. In short, Jabal-i Alhama of the Quraysh tribe is the ancestor of the Albanian people. At the time of the caliphate of the blessed Omar, he populated Albania. His descendants, be they bookless infidels or bookish Muslims, are a race of militant ghazis, brave warriors and clever souls. The Mosque of Bayazid II, also known as the White Mosque, was demolished after the anti-Tanzimat uprisings, although the foundations are still to be seen. A subterranean cistern is still extant and full of water. This mosque, which Evliya attributes to Bayazid II, is known as the Fethiye Cami (Mosque of the Conquest) and popularly as the Red Mosque. 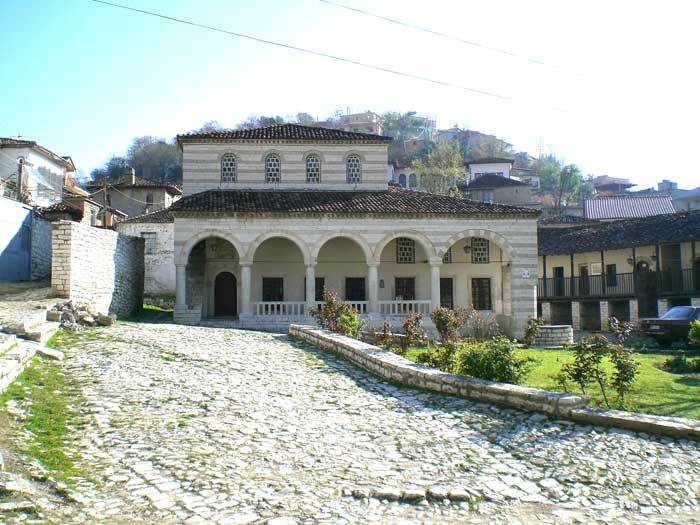 It is the oldest in Berat and, according to M. Kiel, Ottoman Architecture in Albania (1385-1912), Istanbul 1990, p. 74, perhaps the oldest Islamic construction still extant in Albania. It may have been constructed immediately after the conquest of Berat in 820 A.H. [1417 A.D.]. The foundations, the base of the minbar and the outlines of the mihrab, as well as the bottom of the minaret, dating from the early 15th century, are still visible. The upper parts of the staircase are still visible today. i.e. with shops at two levels. The Vakëf quarter is known today as the Jani Vruho quarter. i.e. the quarter which "does not see the light of day." This must be the Gorica (Partizani) quarter referred to below. This quarter across the river and in the shade of the Gorica mountain is still known today as the place where the sun does not shine. By 'Latin' here Evilya probably means Slavic speakers (Serbian, Bosnian etc.). Now known as the Xhamia e Mbretit (Mosque of the King) which we may assume to have been built during Bayazid's Albanian campaign of 897 A.H. [1492 A.D.]. From an inscription, we know the mosque was restored in 1248 A.H. [1832 A.D.] under Mehmed Reshid Pasha. The minaret was torn down some time before 1973 in the wake of the Cultural Revolution. cf. M. Kiel, op. cit. 1990, p. 55 58. Now known as the Xhamia e Plumbit (Lead Mosque), said to have been constructed in 1553-1555. Turkish imâret, charitable institution for feeding and sheltering the poor, often equivalent to an old peoples' home, or to public buildings in general. This is possibly again the Red Mosque, referred to earlier by Evliya as the Mosque of Bayazid Khan. Perhaps meaning Mosque of the Mule (Alb. mushka = 'mule'). The present building of the Halveti tekke of Sheikh Hasan was constructed by Kurd Ahmed Pasha in 1785. The building beside it, housing the dervish cells, dates from the 19th century. He was appointed mimarbashi or chief architect of the Ottoman court in 1055 A.H. [1645 A.D.]. Patron saint of the tanners. The subsequent stone bridge across the Osum was built in 1777-1780, during the time of Kurd Ahmed Pasha. It was badly damaged during the floods of December 1888 and during the First World War. The present bridge was built in 1928. Probably the Slavic part of Europe, as opposed to Firengistan, the land of the Franks or Western Europe. Evliya does not mention them in his description of the bath attendants in Istanbul. He does, however, mention Albanian paving-men, and even gives an example of their street cry in the Elbasan dialect. Evetulata matuzina sultana rahima abur fakite hanifese sultana yana. Renowned scholar and mystic who served as a kind of chaplain to the army at the siege and capture of Istanbul. He died in 863 A.H. [1459 A.D.] and is buried in Göynük in western Turkey. Evliya claimed to have visited his tomb forty times. This Turkish etymology for the present city of Elbasan, founded in 840 A.H. [1466 A.D.] on the site of the ancient Scampis, is doubtful in view of the earlier French form Val d'Elbu recorded in 1180 (Aimon de Varennes, Floriment, lines 4875, 4877). The opening chapter of the Koran. In actual fact, there were only 26 towers. On the figures here, cf. M. Kiel, op. cit. 1990, p. 111. For this section, cf. M. Kiel, op. cit. 1990, p. 116.
i.e. Sultan Osman I (r. 1299 1326). A mistake for 870 A.H. [1465 A.D.]. The three blocks of marble mentioned still hang from the southern gate today. This mosque is referred to below as the Mosque of Mehmed the Conqueror. This clock tower may be the one destroyed by fire around the time of the death of Sultan Mahmud II (1808-1839). 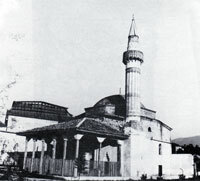 According to Elbasan scholar Lef Nosi (1873-1945), there were still thirty-one mosques in Elbasan in 1931. Of the five mosques which survived the Cultural Revolution of 1967, four were destroyed in the following decade. Only the Naziresha Mosque, outside the centre of town, survived the Communist dictatorship in a recognizable state. According to M. Kiel, op. cit., 1990, p. 116, "This mosque was destroyed in the last century, perhaps with the suppression of the Albanian revolts against the Tanzimat reforms and together with the dismantling of the fortress." There exists a photograph from 1920, however, which shows the construction still above the main gate. Known as the Xhamia e Mbretit (King's Mosque), this largest and oldest mosque in Elbasan was constructed ca. 1490-1500. In 1970-1971, it was mutilated beyond recognition and used initially as a painter's studio, then by the Democratic Front as a 'Centre for the Political Instruction of the People' and finally as a puppet theatre. It has been reconstructed recently, though without the minaret it once had. cf. M. Kiel, op. cit. 1990, p. 114-117. The outer walls of the mosque were still covered in red-coloured Arabic script in the 1960s. Known as the Xhamija e Balliës (Ballia Mosque), dating from 1017 A.H. [1608 A.D.]. This mosque was finely restored in 1965, but demolished in 1970-1971. According to Kiel, op. cit., 1990, p. 120, only the mihrab and part of the mihrab wall were still standing in 1978 as a ruin in the back yard of a department store. cf. Kiel 1990, p. 120 123. Possibly Le'ali Hasan Efendi, poet and scholar from Manastir (Bitola) of whom little is known. cf M. Kiel, op.cit. 1990, p. 123. Known as the Xhamia e Agait (Aga's Mosque) and dating from approximately 1660-1670, it was situated at the the western end of the Long Market, i.e. at the grain market. It was restored in 1935-1936, but was demolished in 1970-1972. cf. M. Kiel, op. cit. 1990, p. 123-124. 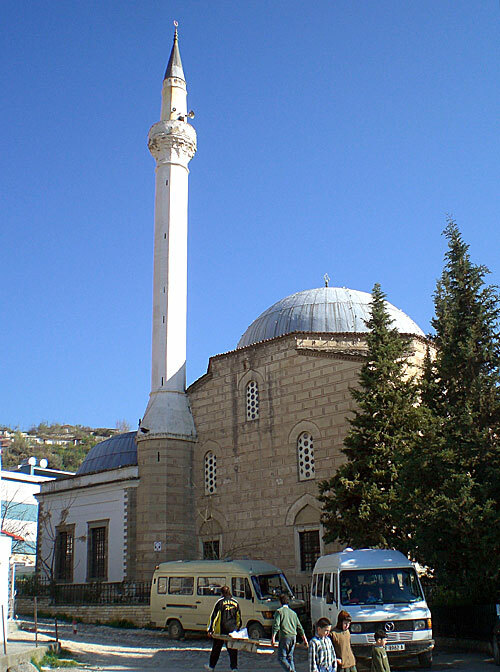 Known as the Xhamia e Lepurit (Hare's Mosque) just to the east of the present-day main hotel, where the monument to Aqif Pashë Elbasani currently stands. i.e. in that he can bring the dead to life. Košice (German Kaschau) is now in eastern Slovakia. This bathhouse, still preserved, was founded around the year 1500. It was restored in 1989. cf. M. Kiel, op. cit. 1990, p. 127-128. This bathhouse, next to the hotel, was still being used in the 1940s. It was situated at the entrance of the Long Market, surrounded by narrow shopping streets. It was rehabilitated and preserved during the dictatorship, but in the early 1990s was transformed into a bar and then briefly into a bingo parlour. cf. M. Kiel, op. cit 1990, p. 126-127. The town of Langadas, east of Thessalonika in Greece, which is nowhere near the source of the Shkumbin river. The reference is to Mehmed Aga, d. ca. 1032 A.H. [1622 A.D.], who was perhaps a native of Elbasan. The construction of the New Mosque, now known as Sultan Ahmed (or the Blue Mosque), began in 1018 A.H. [1609-1610 A.D.] and was completed in 1026 A.H. [1617 A.D.]. This wooden bridge was replaced ca. 1780 by a twelve-arch stone bridge built by governor Kurd Ahmed Pasha, of which photos remain. A couple of cypress trees are all that remain of what was once the namazgjah (prayer-ground) of Elbasan. The square is now covered by kiosks, parked cars and refuse. Today it is called Byshek, in the direction of the village of Shushica. The rock, spring water and a few ancient plane trees still exist. The site was retransformed into a little park with ponds ca. 1985 and a hotel complex was begun in 1989, though never finished. Town south of Strumica in the present-day Republic of Macedonia.